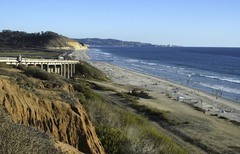 North County Coastal is made up of some of San Diego County’s most unique beach communities including Del Mar, Solana Beach and Encinitas. With a little bit of everything, visitors can spend the day surfing at some of the best spots in San Diego County, play 18 holes at Torrey Pines, home to the 2008 U.S. Open, and dine at San Diego’s only 5 star restaurant, Addison. Del Mar: “Where the Surf Meets the Turf.” Just as Del Mar has its two faces—town and country; surf and turf – it also has two seasons – summer and the rest of the year. Summer is a lively, fast-paced, crowded time with the fair running from June through the beginning of July and then the Del Mar Race Season. Races run every day except Tuesdays with concerts on Saturdays and Sundays. 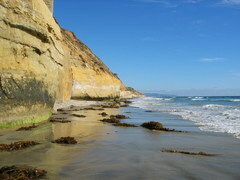 Solana Beach: Known for its rocky cliffs, Solana Beach is a shoppers heaven. For original art, handmade furniture and other one-of-a-kind items, visit the South Cedros shopping district. After a day of shopping Cedros, be sure to hang around and check out the Belly Up Tavern, also on South Cedros Avenue, one of San Diego’s best live music venues. Encinitas: The coolest thing about Encinitas isn’t the beach itself, but the pervasive beach culture. A child of the ’60s that grew up to become a real estate gold mine, Encinitas offers the best of both worlds: the refined tastes and civic responsibility that come with prosperity and the energy and vitality that come from free-spirited ideals and attitudes.